The building of new houses can bring unexpected returns. 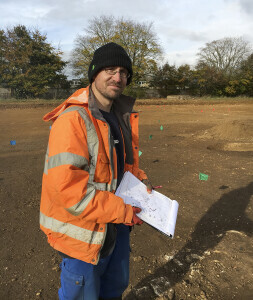 In keeping with all new development sites, an archaeological survey is under way in the field next to Wychwood Primary School under the expert guidance of Pierre Manisse from Thames Valley Archaeological Services (TVAS). Whilst the dig is in its early stages – with work likely to go on until the end of November – the site is already throwing up some interesting facts. The original field showed clear signs of Ridge and Furrow agriculture, and the removal of 40cm of top soil has revealed a large number of post holes, ditches, furrows and a well. There is also some evidence of another barrow. The well is a particularly enticing find because, once excavated, it could reveal wood or leather fragments due to the anaerobic nature of the soil. There may even be animal bones where some luckless beast fell to its death. Pierre’s initial thoughts are that there are clear signs of Bronze- and Iron-Age remains with the further possibility of a Roman enclosure which goes under the School. The myriad pits show clear signs of burnt stone and could have been fireplaces. Pierre and his team will no doubt build up a more comprehensive picture of life in the Wychwoods around 200BC to Roman times. The Wychwood will run a full article on their finds in the Feb/Mar 19 edition.